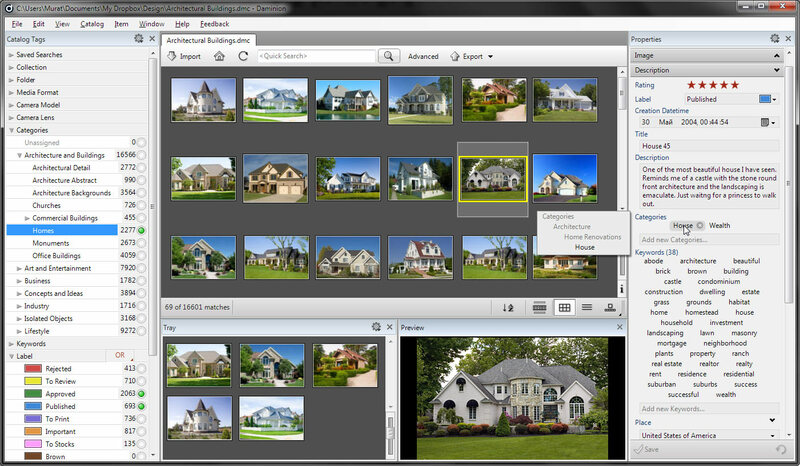 What photo management software to use on local network? Multiple users can view, annotate, and edit your digital assets quickly and without risk of losing information; your photo database will be protected from irreparable damage, which is not the case when using a file-server based solution. Daminion Server can run on common Windows platforms like Windows XP Standard or Windows 7 Business. It is not necessary to buy an expensive Windows Server. None of the endless monthly fees demanded by hosted solutions. You pay once. No need to hire a system administrator, and no specialist knowledge necessary to install and administer the Daminion Server. Version Control (Check in/out). Avoid work being redone because you’ve lost your original versions! Focused on cataloguing (no built-in fancy image editors and publishing tools) with excellent bridge to external photo editors like Adobe Photoshop and Adobe InDesign. Multiple catalogs (both local and shared) can be opened simultaneously like the pages of modern web-browsers. Using hierarchical tags you can describe your content more precisely and as result spend far less time locating your important files. During importation, the Place Tag will be filled out from information extracted from the IPTC/XMP. Using the Properties panel you can not only see all the media file information but you can also display complex hierarchical tags. Any changes you make can be undone until you click, Save. Integration via XMP Metadata is the best way to exchange information between different systems. With XMP, you won’t have to depend on different API versions of various other systems. Daminion will read/write metadata in many formats including image, camera RAW, vector, video, audio and PDF files. Please spend 5 minutes to check it out and leave us your feedback. We always appreciate your time and your suggestions! Really great piece of software. I am so glad that I chose to purchase this programme, it got consistently good write-ups in reviews of picture management software and after trying the free version for a couple of days I purchased the full version as I have many thousands of pictures. Thanks again for a terrific programme! NO NETWORK, NO SERVER, NO PROBLEM! HOST YOUR STARTUP'S DAM IN THE CLOUD.